Design Earth, Below the Water Towers, Pacific Aquarium, 2016. How do we make sense of the Earth at a moment in which it is presented in crisis? To live in an epoch that is shaped by extensive environmental transformations is to be confronted with risks and uncertainties at a planetary scale. Paradoxically, we remain little mobilized, in part because of our failures to comprehend the reach of a story that is both difficult to tell and hear. Geostories takes aim at this crisis of the imagination. 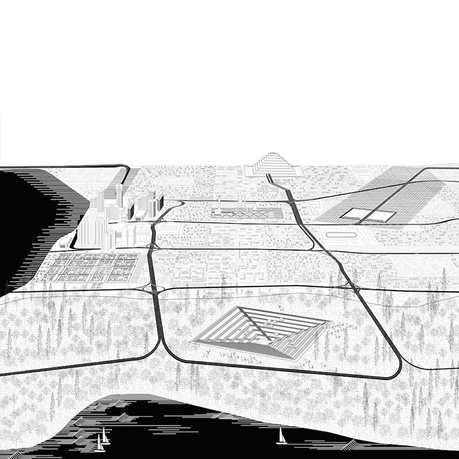 The prefix Geo- engages the Earth as a grand question of design: a concern, site, scale, and aesthetic that makes visible the unaccounted spaces of environmental externalities, such as deforestation, resource extraction, trash, water shortage, and space debris. 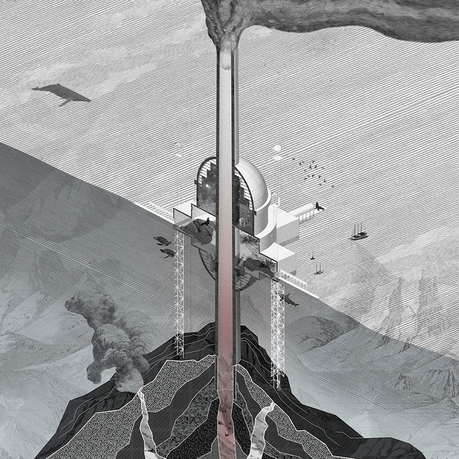 Additionally, the suffix -stories channels large-scale technological systems into cautionary tales that highlight the political and ethical implications of our impermanent Earth, all while imagining fantastic survival strategies. 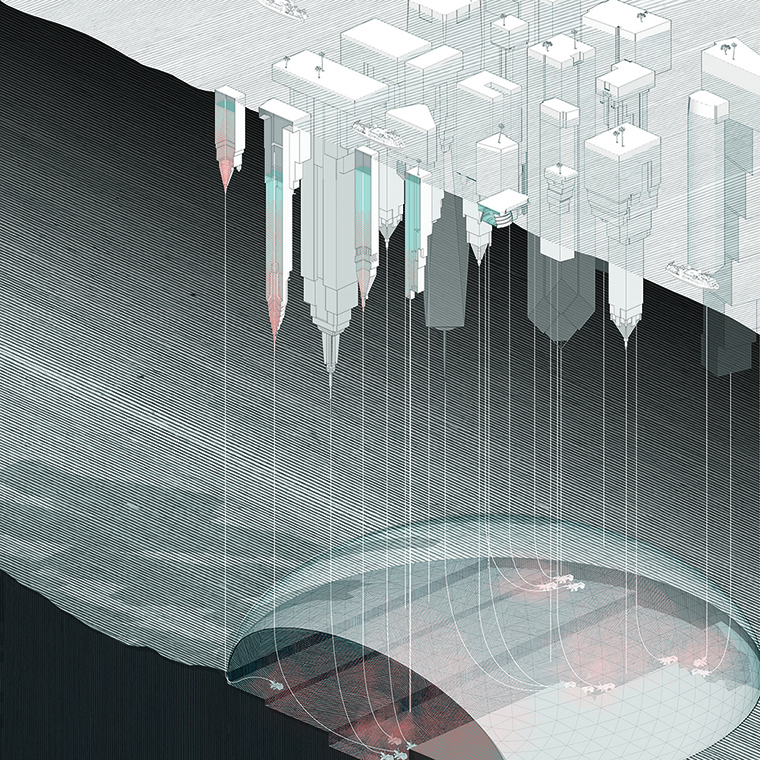 Rania Ghosn is partner of Design Earth and assistant professor at the Massachusetts Institute of Technology’s School of Architecture and Planning. Her work critically frames the politics and aesthetics behind technological systems. She holds a PhD in design from Harvard University’s Graduate School of Design, where she was a cofounding editor of New Geographies and editor-in-chief of NG2: Landscapes of Energy (Harvard GSD, 2010). 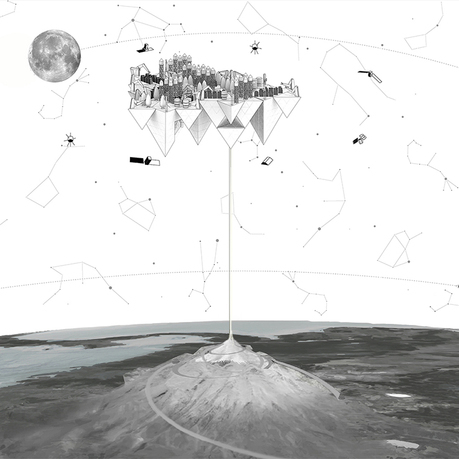 El Hadi Jazairy is a partner of Design Earth and assistant professor of architecture at the University of Michigan. 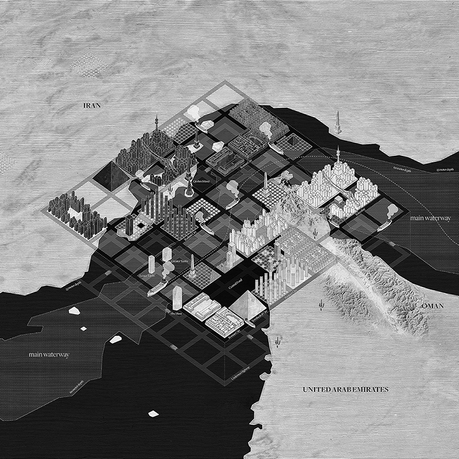 His research investigates spaces of exception as predominant forms of contemporary urbanization. Jazairy earned a PhD in design from Harvard University’s GSD, where he was a cofounding editor of New Geographies and editor-in-chief of NG4: Scales of the Earth (Harvard GSD, 2011). Design Earth has been recognized with several awards, including the Architectural League Prize for Young Architects, and an award from the Jacques Rougerie Foundation. 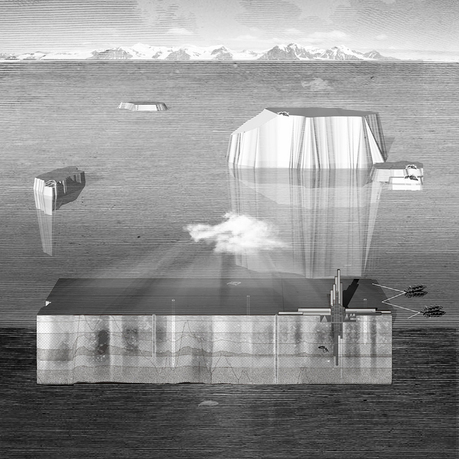 Design Earth's work has been exhibited internationally at Parsons (New York), the Venice Architecture Biennale, the Oslo Architecture Triennale, and Beirut's Sursock Museum, and the practice’s books include Two Cosmograms (MIT Keller Gallery, 2016) and Geographies of Trash (Actar, 2015), the latter of which won an ACSA Faculty Design Award. Some recent essays have been published in the Journal of Architectural Education, ARQ, MONU, San Rocco, the Avery Review, Bracket, and Perspecta.